Franck Ribery has been left out of Bayern Munich's squad to face AEK Athens in the Champions League due to a back injury. 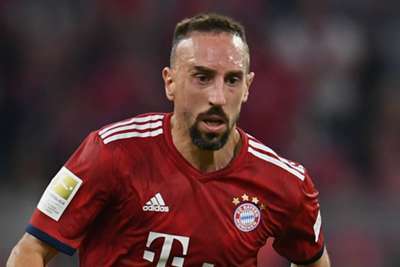 The 35-year-old has made four Bundesliga starts this season and he featured in Bayern's Champions League outing against Ajax, which ended in a 1-1 draw. A vertebral blockage keeps him out of the visit to Greece, meaning coach Niko Kovac could well keep faith in Arjen Robben and Serge Gnabry on the flanks following a 3-1 victory over Wolfsburg on Saturday. That win was Bayern's first in five attempts in all competitions and came courtesy of two goals from Robert Lewandowski and one from James Rodriguez. Both Lewandowski and James are in the squad making the trip for Tuesday's game at Athens Olympic Stadium, where AEK were beaten 3-2 by Benfica in their last Group E encounter.